March 30, 2012 -- Unexpected tire smoke Friday evening wasn’t the way Steve Torrence preferred to end Friday’s qualifying for Sunday’s SummitRacing Equipment.com Nationals. 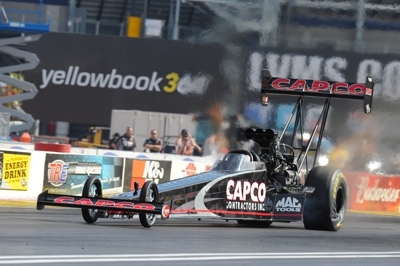 His first trip down The Strip at Las Vegas Motor Speedway in 3.960 seconds at 308.99 mph in the Torrence Racing/Capco Contractors Top Fuel dragster was second-quickest of the session. However, racing conditions improved later in the day and when it was over, he was 11th. He has two more attempts coming up.